ORIED has no shortage of staff who go above and beyond the call of duty. This year’s roster of nominees showcases some of the best. Accolades were given on Thursday, April 13, 2017 at the Friday Institute. Winner in the SHRA category was Amy Parker from the Office of Technology Commercialization and New Ventures (OTCNV). Carrie Gage from the Institute for Transportation Research and Education (ITRE) took the honor in the EHRA category. Both will move on to the university level and will be recognized on June 7, 2017, at 2:00 p.m. in the Talley Student Union State Ballroom. Carrie Gage, Director of Finance and Administration for ITRE, was nominated by colleagues and friends in the Public Service category. Carrie joined the Institute during a time of transition and stepped up to the plate to provide leadership and support to a team she barely knew. Through this challenge she improved morale and communications throughout the Institute and increased operational efficiency. She balances her work life with an equally active altruistic life — volunteering in the community for a number of causes and efforts including hospice family support, hospital patient services, reproductive educational services, support to overburdened teachers, and turtle fostering and rehabilitation just to name a few. Carrie makes a tremendous impact by placing others ahead of herself on a daily basis. ITRE and SPARCS staff receive top honors for ORIED Awards for Excellence. Chris Cunningham, Interim Director for ITRE’s Highway Systems group, and Rusty Earl, Application Analyst for SPARCS, will move on to the university level. Chris Cunningham was nominated in the Human Relations category. In 2015 he stepped in to fill a leadership role ensuring a smooth transition and no disruption to work. He instituted innovative working group practices that allowed team members to share and shift office space as project needs arose, creating strong teams and greater work efficiency. During a four-month period, he led four national proposals for research to expand ITRE and NC State’s national presence. Rusty Earl was recognized for his efficiency and innovation in streamlining processes for both SPARCS and Environmental Health & Safety. Rusty played a major role in updating SPARCS’ information systems to meet new federal standards for contracts and grants. For EHS, he developed a new digital system for performing safety inspections at sites across campus. 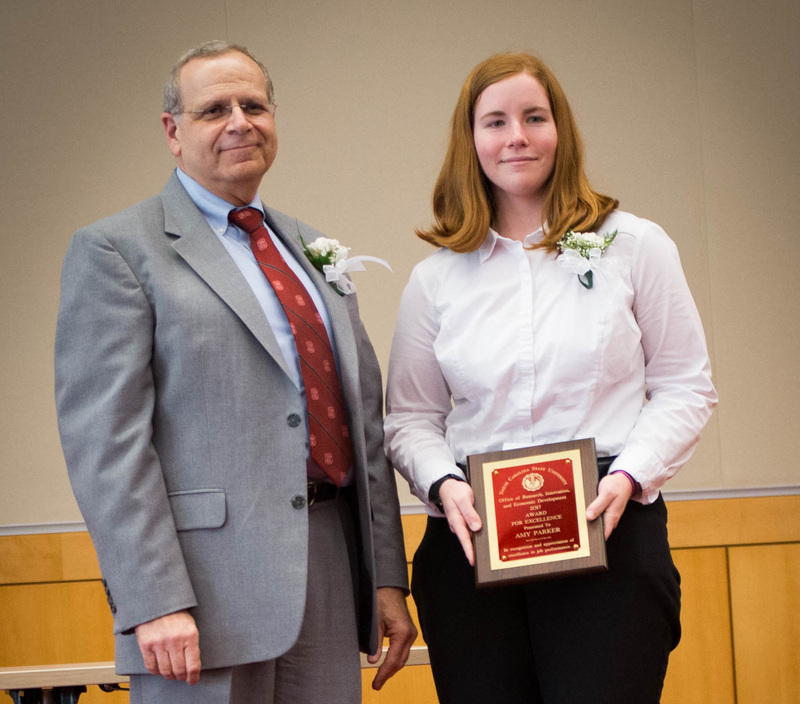 Mei Ingram, Research Scholar for ITRE, received the EPA honor for public service to her unit. She was instrumental in rebranding and revitalizing the units social committee to an active Community Service committee, organizing and participating in 4-6 group volunteer activities every year. Through her recruitment efforts, nearly half of the ITRE staff regularly participate in activities that have included home building for Habitat for Humanity, distribution of food for the NC Food Bank and Inter-Faith Food Shuttle, and cleaning and building trails for the Mountain-to-Sea Trail and the City of Raleigh’s Walnut Creek Wetland Center. Patrick Crowley, Research Proposal Specialist for the PDU, was nominated for customer service. Patrick works closely with both internal and external faculty during the process of putting together large, multidisciplinary proposals. His friendly demeanor and discipline approach to the job help orchestrate the complicated process. Patrick takes that can do attitude to off-campus activities in volunteering for causes he is passionate about — coaching youth in golf and life skills through the First Tee of the Triangle program. Two members of the North Carolina Institute for Climate Studies took home top honors at the 2014 Awards for Excellence program for NC State’s Office of Research, Innovation and Economic Development. They move on to the university awards program in June. Jonathan Brannock, an information technology operations analyst who received multiple nominations, provides tech support and user-friendly customer service. He initiated a building-wide wireless network and cluster computing capability, added high-definition video-conferencing capability, and centralized authentication management. His talent and tenacious work ethic even resolved a critical technology problem that had stymied system vendors. In addition to tirelessly executing his assigned quality control responsibilities for a gold-standard national climate data network, research associate Ronnie Leeper, developed a website to move that data into operations for varied partners. He also bridges gaps among research priorities of the various divisions of host National Oceanic and Atmospheric Administration by initiating collaborative projects that demonstrate synergistic communications. Nicole Wilkinson and H. Rhett Register of Water Resources Research Institute. Register also has duties with North Carolina Sea Grant. 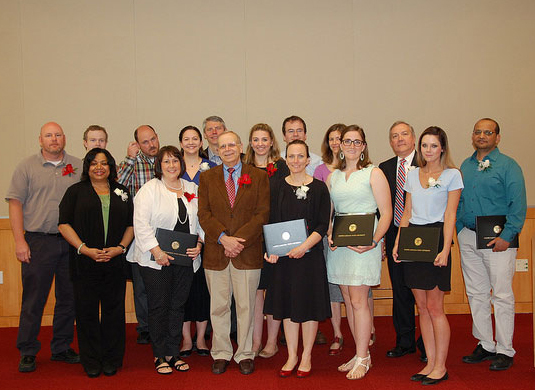 The 2014 ORIED Awards for Excellence Program included, from left, Vice Chancellor Terri Lomax, and nominees: Ronald Leeper, Gail Platt, Mindy Huffman, Deb Paxton, Rhett Register, Angela Farrior, Jessica Matthews, Leigh Lane and Jonathan Brannock. The program, hosted by Vice Chancellor Terri Lomax, included a inspiring words and music from Bill Leslie, a news anchor at WRAL and renown Celtic musician. The 2014 ORIED awards committee includes: Katie Mosher, chair; and membersMarie Blanchard, Lauren Bridges, Melanie Clark, Marilou Coggins, E-Ching Lee, Janice Mills, Lara Shields, Christie Vann and Miriam Hines. Katie Mosher and Christie Vann are the Office of Research, Innovation and Economic Development’s recipients of the 2013 Awards for Excellence. The awards recognize employees who make a significant contribution to their department, division, the University community or the lives of others. Nominees are selected based on their outstanding service, innovations, public service, safety/heroism and human relations. Mosher, ORIED’s EPA winner, is communications director at North Carolina Sea Grant. She also is the editor for ORIED’s Results magazine. In her nomination, Mosher was cited for her dedication in leading communications in one of the top Sea Grant programs in the nation. In addition, she also has made national impacts through her work on the National Oceanic and Atmospheric Administration’s Task Force on Rip Current Safety and coordinating a team that developed a program to raise awareness of invasive aquatic species. Vann, the SPA representative, is the assistant to the director at the Institute of Transportation Research and Education and the program coordinator for the Highway Systems Group. Her colleagues singled her out for superior performance at work, cheerful support for their trainees and clients, and involvement in founding a local nonprofit organization that helps individuals and families deal with Huntington’s Disease. Mosher and Vann will join other North Carolina State University nominees at the University Awards for Excellence program on June 12 at the Hunt Library. Five university-level winners will be entered in the Governor’s Award for Excellence selection process later this year. Mary Beth Barrow, North Carolina Sea Grant, chaired the 2013 Awards Selection Committee, with special assistance from Miriam Hines, Vice Chancellor’s Office. The members were Bonnie Aldridge, Research Development; Lauren Bridges, Centennial Campus Partnership Office; Marilou Coggins, Small Business and Technology Development Center; E-Ching Lee, NCSG; Janice Mills, NC Institute for Climate Studies; Gerry Sasser, Office of Technology Transfer; Lara Shields, Sponsored Programs and Regulatory Compliance Services; and Christie Vann, Institute for Transportation Research and Education. 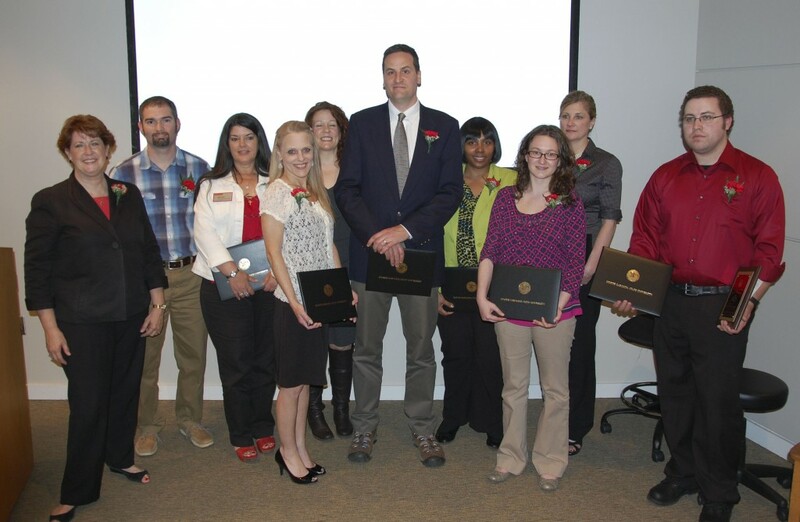 Two employees were swept into the 2012 ORIED Awards for Excellence winners’ circle. Sea Grant Executive Director and Water Resources Research Institute Director Michael Voiland (left) won the EPA Award for Excellence. 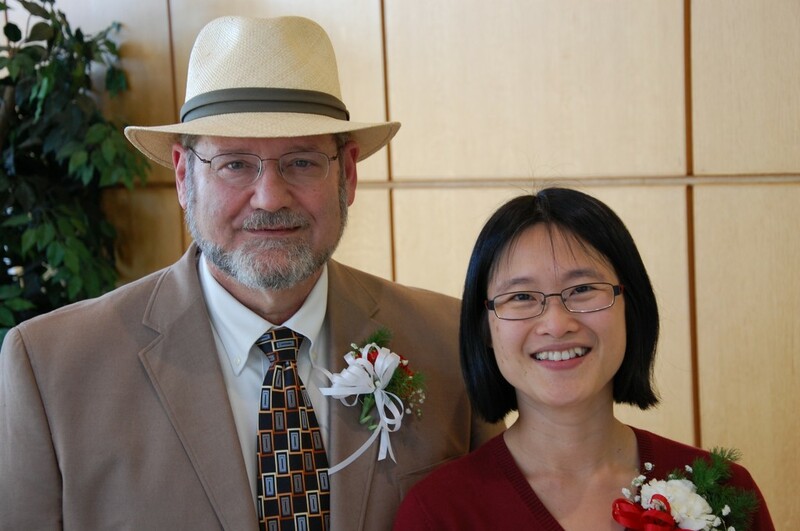 Science Writer/Editor E-Ching Lee (right) of Sea Grant won the SPA Award for Excellence. Voiland, nominated by the staffs of both offices he directs, was recognized for management excellence leading to major awards from state and national agencies for contributions to coastal research and applied practices. Appointed chair of the Waterfront Access Study Committee, which included members from all sides of the contentious waterfront access issue, he led the committee to make a recommendation to the N.C. legislature that resulted in a $20 million fund to support access along the N.C. coast. As managing editor of Sea Grant’s award-winning magazine, Coastwatch, Lee was recognized for her exceptional service in, among other areas, selecting news topics that keep N.C. citizens informed, such as ways coastal communities can plan their own futures effectively. 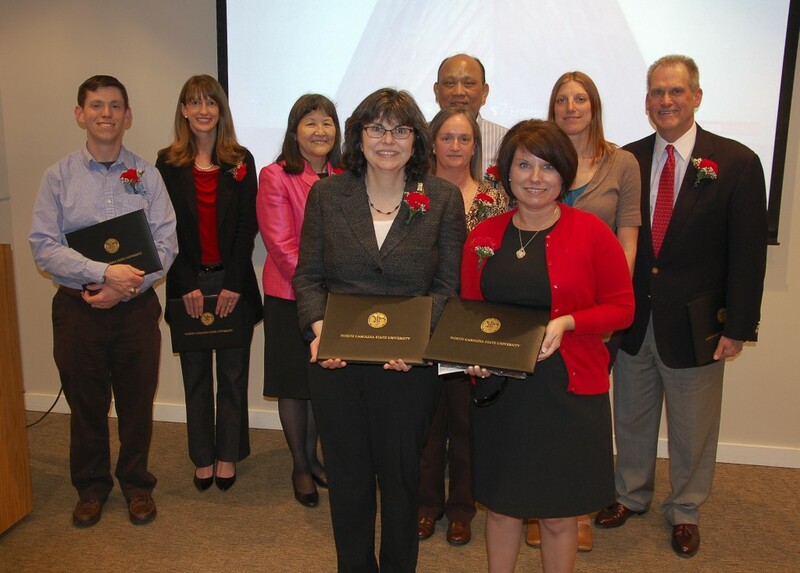 The NC State Awards for Excellence program recognizes permanent employees for “outstanding accomplishments that do not fall entirely within normal duties, but are a major contribution reflecting credit on the person and the State.” Lee and Voiland will represent ORIED in the University Awards for Excellence program. Five university winners will be entered in the Governor’s Award for Excellence selection process later this year. Also nominated for excellent performance were Sharell Bynum, Small Business and Technology Development Center; Amy Herman, Tim Linker and Stefanie Saunders, Sponsored Programs and Regulatory Compliance Services; James Martin, Nagui Rouphail, Bastian Schroeder and Bonnie Sluder, Institute for Transportation Research and Education; Janice Mills and Scott Stevens, NC Institute for Climate Studies; and Amanda Ottoway, Office of Technology Transfer. 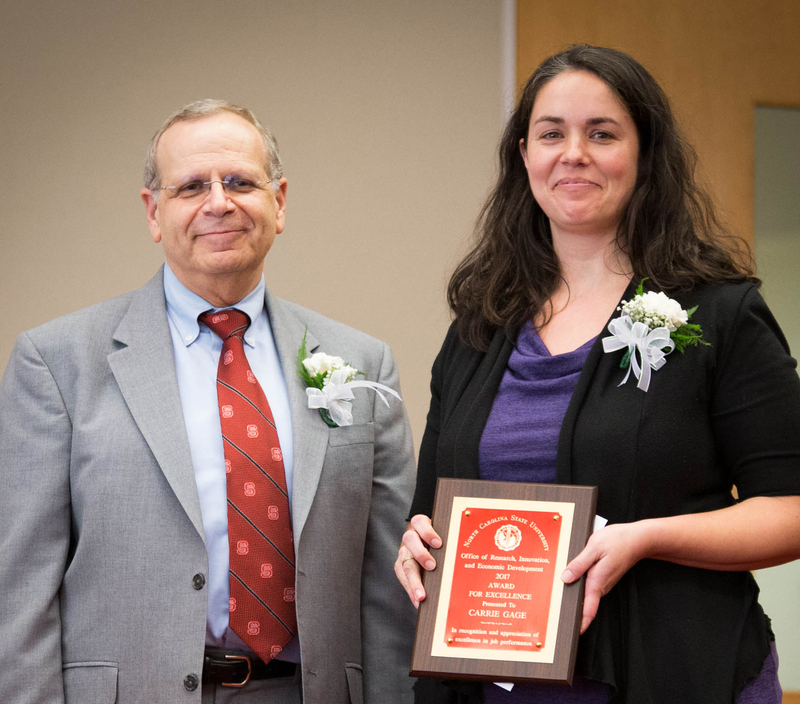 An associate director and a business officer in institutes within the Office of Research & Innovation (ORI) at NC State University were named the 2011 recipients of the Awards for Excellence. Mary Elizabeth Barrow, a fiscal officer for both the North Carolina Sea Grant Institute and the Water Resources Research Institute (WRRI) and Robert Foyle, associate director in the Institute for Transportation Research and Education (ITRE), were recognized in a recent ceremony at the university. 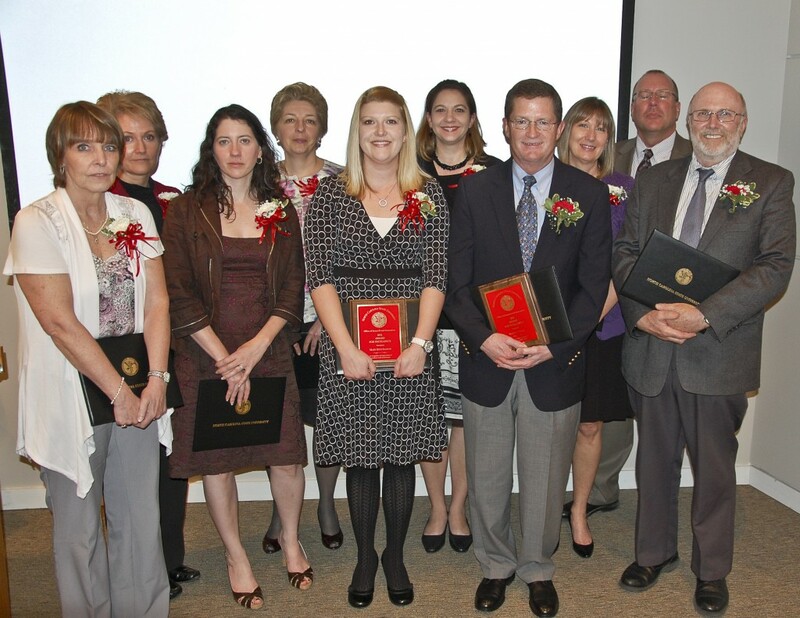 The Awards for Excellence program is designed to recognize the accomplishments and achievements of permanent NC State employees. Employees are selected for their outstanding service, innovations, public service, safety/heroism and human relations. Barrow was recognized for overseeing the fiscal responsibilities of both Sea Grant and WRRI, which includes managing and administering grants across North Carolina to academics and citizen scientists. Foyle was cited for his ability to train transportation engineers and technicians since first being employed by ITRE in 1980. Both employees were also recognized for their community service. Barrow and Foyle will participate in the University-wide Awards for Excellence ceremony in May. Other ORI nominees for the awards were: Nancy Balley, Liana Fryer, Martina Kryzywicki, Linda Lancaster, Gloria Putnam, David Robinson, Reena Schaffer, and Larisa Slark.